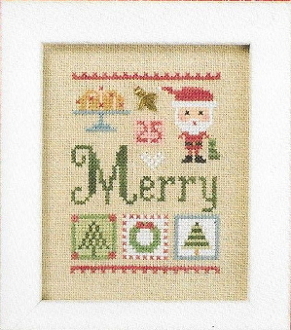 A Christmas counted cross stitch design perfect for holiday decorating, adorn with the enclosed tiny Holly charm. Part of Lizzie Kate's Celebrate with Charm series. Chart includes a tiny Holly charm. Design size: 2.75" x 3.75". Model stitched 2 over 2 on 32 count Light Mocha Belfast Linen (not included). Stitch count: 43w x 58h. Instructions given for Weeks Dye Works/Gentle Art threads with conversions given for DMC embroidery floss (not included).